I guess we all want to be safe. To know that there is somewhere we can be secure, and free from harm. To know that there is someone we can trust to keep us safe. A haven of shelter and refuge. 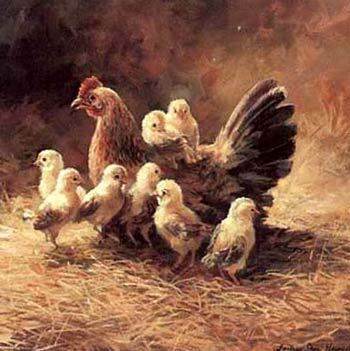 A hen gathers her chicks under her wings for safety. There they are safe from harm and danger. Close where she can shield them from danger and watch over them. Jesus knows there is danger coming. That there are those who wants rid of him. But his response still is to care for those who need him, those who don’t understand, those who haven’t listened. Jesus wants to gather the people to himself – but they won’t let him. He wanted to offer them safety and security, but they thought they knew better and rejected his peace and security. What a wonderful picture it is of God wanting to gather us safe under his wings. I can live with that idea of God. To know that in him there is safety and security from the storms of life. In him is someone I can always turn to and know there will be shelter and warmth. God wants to hold us that close. Do we let him? Or do we want to run away? To find our own ways of protection? Will I find the safety and security I long for in the arms of God, sheltering under his wing? in the safety of her wing.